Livened by the voice of Tarikuddin Ahmed, this song has conquered the tandems of time and hearts of many. The words of Malin Bora and music of Durga Bhuyan are so delicately blended by Tarikuddin Ahmed with his amorous voice. The essence of every word of this song seems to linger in the singer’s voice! Even after listening to it over and over again, it keeps me drawing towards it- for yet another time! What the musical conjuror has done with the song! The song is a tribute to the experiences and agony of a forsaken lover who realizes his lady love’s heart has been plundered by the love of another man. In the year 1947-48, this song ‘Eman dhuniya mukutar mala’ was released by the Columbia Record Company and became an immediate hit. It has not lost its flavor yet and continues to flourish. 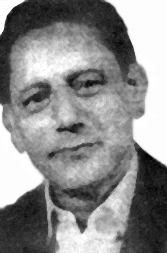 Tarikuddin Ahmed can be considered as one of the best voices of the twentieth century. Born to Sheikh Sharifuddin Ahmed and Jabina Khatun in Nagaon’s ‘Borbojar’, Tarikuddin lost his father at an early age. Brought up on his mother’s love, Tarikuddin loved singing since childhood. So he took his first lessons in music under Purnendra Nath, the musical maestro himself. Nagaon’s Ikramul Mazid, Durga Bhuyan and Tarikuddin Ahmed- the trio continued their musical journey together for quite sometime. In matters of Hindustani Classical music, Ikramul Mazid was a class act. Durga Bhuyan was more of a composer and Tarikuddin Ahmed had this amazing gift- his voice and was the better singer among the three. They loved to compose their music based on the ‘raga’ of classical music. Generally, Durga Bhuyan composed the music which was refined, modified and ornamented by the other two- very delicately. Songs in the voice of Tarikuddin Ahmed and words of Malin Bora recorded in gramophone like ‘Eman dhuniya mukutar mala’, ‘Bidayar porot nagathiba mala’ speak for themselves. Tarikuddin also composed music for the Assamese Movie ‘Puberoon’ which was screened at the prestigious Berlin International Film Festival. In this movie Tarikuddin lent his voice to the song- ‘Ei prithivi maya momotaei nidile biday’. Through his wonder web of subtle thoughts, lyricist Malin Bora could put his inexplicable experiences of love and weave a fragile garland of words! Malin Bora is among the popular lyricists of the twentieth century. Malin Bora’s famous songs are ‘Eman dhuniya mukutar mala’, ‘Bidayar porote nagathiba mala’, ‘Ei prithivir maya momotaei’(Puberoon), ‘Dhulir dharat Apon Pahori’(Biplobi), ‘Jaabor Bela Tuli Dilu’ (in the voice of Pulok Banerjee) etc. Malin Bora was born in the year 1906 in Nagaon district’s Pakhimoria sub division at a place called Borjoha. Born to a poor family, Malin had to struggle since his childhood. His father was Bilash Chandra Bora. As a kid, young Malin showed deep interest in music and had a special liking for poetry. After completing his M.V. exams in the year 1920, he enrolled himself in the Government High School but had to quit when the Non Co-operation Movement was launched as a part of India’s struggle for independence. Later in the year 1942, Malin participated in the Quit India Movement and was imprisoned for six months. Apart from writing many songs, Malin Bora also contributed his poems to magazines such as ‘Abahon’ and ‘Ghor Jeuti’. His published anthologies are ‘Renu’ and ‘Xuror Kabita’. He is also the writer of the novel ‘Bolakar Rekha Khedi’. In the field of modern Assamese songs, Malin Bora occupies an enviable position. ‘Eman dhuniya mukutar mala’ is an immortal creation of Malin Bora. With the magical voice of Tarikuddin Ahmed, this song still occupies the hearts of many.